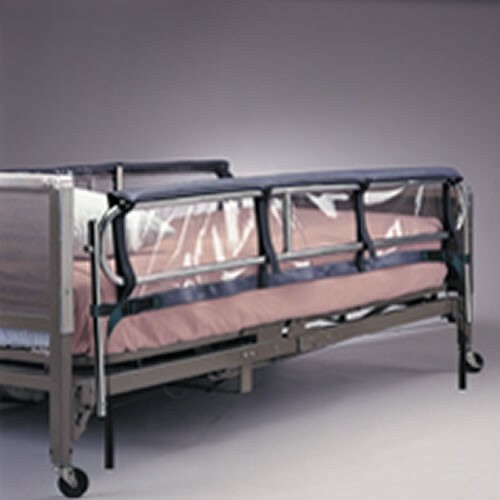 These bed rails deter patients from attempting unassisted bed exits, and they reduce the risk of side rail entrapment. They are made of durable, firm foam with hook and loop straps to allow fast and easy application and removal. The design provides maximum rail cushioning and covering. The pad is 1" thick and is available in various lengths to accommodate most healthcare beds. For your convenience and for higher levels of healthcare, the pads can easily be wiped clean with liquid disinfectant. They meet CA #117 flame retardancy standards. One of the more unique features about these pads is an optional window that runs the entire length of the 72" and 35" length pads (option not available for the 60" or 43" length pads). The windows are extremely useful in providing continuous monitoring and allow patients easy access to side rail mounted controls. Please specify size and window option when placing your order. One pair per package. The bed rail pads with window that I purchased arrived in a timely manner and tracking was easy to follow. Vitality Medical was a pleasure to work with.